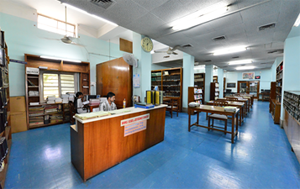 Library caters to the documentation and information needs of the Institute and other Research Organizations, Home Science, Medical Colleges and a large number of nutrition enthusiasts. The library has been playing a key role in reference activities by offering information services like MEDLINE Searches, Proquest Medical Library Full Text Database of journals and other online retrieval activities using the LAN Network of the Institute. Library participates in exchange of data, journals and information using the URL . Resource Sharing and User Education Programmes are continuously being undertaken by the Library. Institute’s Scientific papers going in for publication in Scientific Journals etc., are usually routed through the Library and a data-base of the published papers is also made accessible through on-line services using NIN Website. The Library services are being further strengthened with continuous support from Indian Council of Medical Research for accessing E-journals from JCCC@ICMR and J-Gate database. The Library is also a member of ERMED Consortia of National Medical Library, New Delhi provided by ICMR for accessing E-journals Online Subscription of 4 Core Journals such as LANCET, NATURE, NEJM, SCIENCE has been renewed by ICMR is also accessible. NIN’s Library is a repository of information on various topics related to health and nutrition. 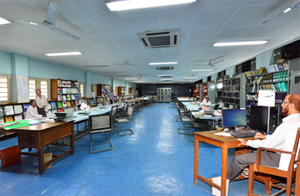 The Library started its collection and development of print / non-print media from the year 1959 and has now grown into a full-fledged poly-media based Information Centre. Housed in the main building, the Library can accommodate over 100 users. The NIN Library is a central facility for three other institutions on the same campus i.e. Food and Drug Toxicology Research Centre (FDTRC), National Centre for Laboratory Animal Science (NCLAS) and National Nutrition Monitoring Bureau (NNMB). The Library has a fairly large collection of over 18,082 books, about 37,543 bound Volumes of Journals, 13,371 reports, 383 foreign and Indian journals, and an equal number of News Letters, Popular Journals etc. on gratis /exchange basis. Library not only caters to NIN’s Scientists, but also to a large number of outside clientele, from various walks of life. Collection and development of a comprehensive print/non-print materials in nutrition science. To serve as an Information Centre in nutrition and allied sciences. To collaborate in the integrated development of various relevant national information systems and function as a feeder/receiver to/from similar international systems. Membership is extended to all the NIN staff including scientists, technical, administrative staff, M.Sc (Applied Nutrition) students, research scholars and also to the regular trainees at the Institute, who register their names at the library counter. Scientists from medical colleges, home Science colleges and other research Institutes can also become members by producing an introductory letter from their respective Heads of Departments. However, borrowing facilities and the computer facilities are limited to the staff of the four centres. Visitors are permitted to use the Library only on working days during the working hours. The main services include lending, reference and access to electronic database through PUBMED, INDMED, MEDIND, J-Gate plus JCCC@ICMR,, ERMED Consortia, ICMR subscribed E-Journals, Free Online Journals, and INTERNET sources. The Library is equipped with modern facilities such as E-Books, CDROMS of MEDLINE, Diskettes of Current Contents (LS), Proquest Med. Lib. : full text E-Journals database and eighteen (18) nodes for INTERNET activity. Library is provided with user-friendly application software `TLSS’ - Total Library Solution Software and around 75,000 records are inputted and the database can be accessed through OPAC over the LAN nodes. The Library also provides an excellent Photostat facility, which is available within the Library. Resource Sharing and User-Education Programmes are continuously being undertaken in the Library. Institute’s scientific papers going for publication in Journals etc., are being routed through the Library and a data-base of the published papers is made searchable through on-line services. The Library has been instrumental in conducting various workshops and training programmes for Library professional staff of the ICMR Libraries. JAMAI-OSMANIA, P.O. BOX No. 718.